Please help us to continue to spread the word about Ask the Question by sharing this page on social media with your friends, family members, co-workers or anyone at all who you think would benefit from it. You can also help us by downloading the event flyer and posting it wherever allowable throughout the year - such as stores, local businesses, libraries, faith communities - anywhere you think it would bring attention to this important issue and event. The flyer is available in two formats: Ask the Question (pdf) and Ask the Question (.png). The version of the flyer that was used to promote the event, and which includes the dates and event locations, will remain available for anyone interested. Ask the Question - with event locations (pdf) and Ask the Question - with event locations (.png). Perinatal mood and anxiety disorders are common health concerns for many expectant or new mothers. However, the majority of women suffering from these medical illnesses go unrecognized and untreated. On Saturday, May 2, 2015, the Long Island Perinatal Mood and Anxiety Disorders Collaborative of the Postpartum Resource Center of New York, held the inaugural Long Island Screening Day for Perinatal Mood and Anxiety Disorders Awareness event. Over 1,000 families were reached as a result of our efforts for the first ever Long Island Screening Day for Perinatal Mood and Anxiety Disorders Awareness! 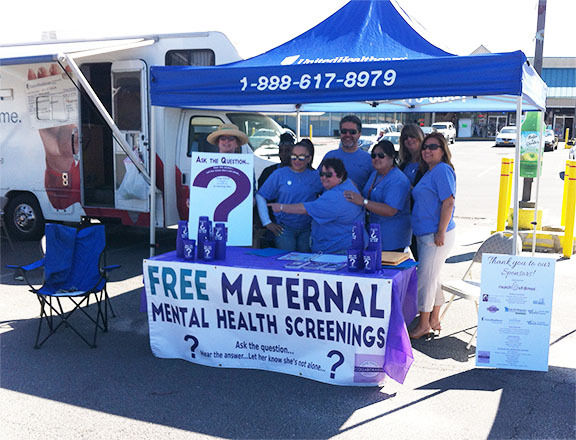 Our goal of the event was to raise awareness of perinatal mood and anxiety disorders and to prove how easy and effective screening can be. We staged screeners at various public locations where new moms frequent. 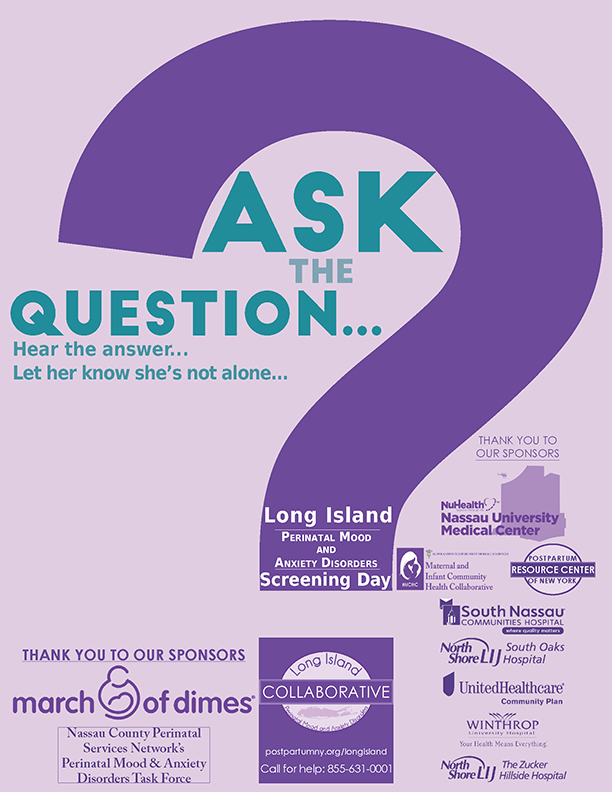 Thank you to the Long Island Perinatal Mood and Anxiety Disorders Collaborative Partners, the sixty Screening Day volunteers, Screening Day team leaders, event location hosts, our sponsors, and the Long Island Community for making this event a success! Help us to continue to Ask the Question. Ask a mom or dad-to-be or a new parent "How are you doing? ", "How are you feeling?" Hear their answer... Let them know they are not alone. There is help and hope. For help and information, please see the resources below. Below are photographs taken from screening events held across Long Island. Please click on the image below to view in Lightbox. Deborah Rotunno, CD, CPD and Katherine Koncelik, CDC, CLC: Long Island Doula Association, Inc. Thank you to all of our supporters of the campaign! Donations are gratefully accepted through May 2, 2015. Please click here to reach our fundraising campaign page.